Holy liturgy to Conclude the 54th Convention in Tampa, Florida. On July 29th 2018, His Holiness Patriarch Mor Ignatius Aphrem II celebrated theHoly Qurobo at the conclusion of the 54th Annual Convention held in Tampa, USA. 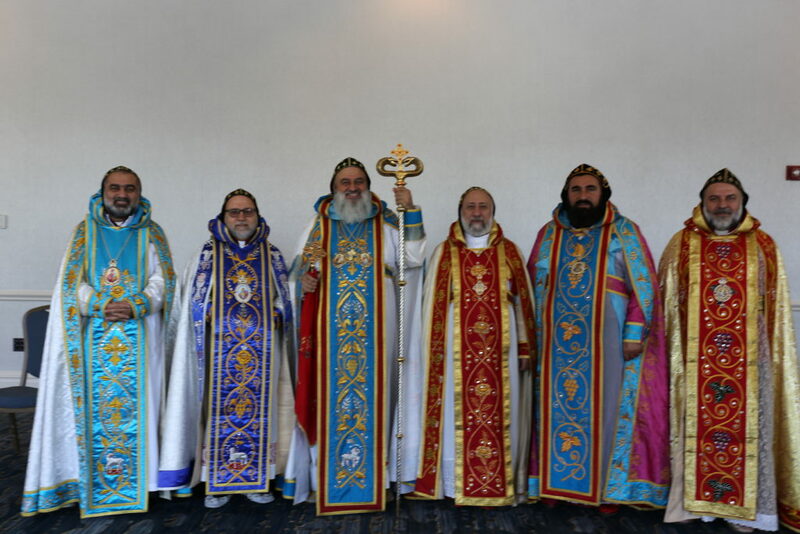 Their Eminences Archbishops Mor Dionysius John Kawak, Patriarchal Vicar for the Eastern USA, Mor Clemis Eugene Kaplan, Patriarchal Vicar for the Western USA, Mor Dioscorus Benjamin Atas, Patriarchal Vicar in Sweden, Mor Justinos Boulos Safar, Patriarchal Vicar in Zahleh and Bekaa, and Mor Maurice Amsih, Archbishop of Al-Jazeerah, assisted His Holiness during the Holy Qurobo. The clergy from both Archdioceses who participated in the convention were also present in the Holy Qurobo. In his sermon, His Holiness spoke about the theme of the convention: “Forgetting what is behind and straining toward what is ahead” (Philippians 3: 13). His Holiness stressed that faith guides the believers from sin to repentance and from spiritual death to everlasting life. He said that the goal of every Christian should be one: to know God, to participate in His passion and to believe in His life-giving resurrection. Christ should be a priority in our lives and all our deeds should spring from our faith. He also spoke about humility which is the core of Christianity. At the end of the Holy Qurobo, His Holiness blessed the faithful and wished them success in their lives. « His Holiness pays a visit to St. Athanasius Church in Tampa, Florida.